Last fall I attended the annual meeting of the Mid Atlantic Coastal Ocean Observation Regional Association. That’s MACOORA for those of you who love acronyms. And if you do, then you’ll be excited to hear that an underlying theme of the meeting was that MACOORA and MARCOOS were merging to form MARACOOS (say that 3 times fast), but that’s a story for another day. The meeting provided a wonderful first-hand opportunity to hear from people who use ocean data in their daily lives. The last time I attended, about 5 years ago, the bulk of the participants were research scientists, who were in the early stages of setting up what would become today’s regional ocean observing system. But times have changed, and this time there was a great diversity of end-users. As a product developer, I really enjoyed hearing user’s insights on the kinds of data they access, and perhaps more importantly, how they would like to utilize various datasets in the future. We don’t often have a chance to get out of our office much and interact with real live users, but it’s a crucial component of our work. Recreational Fishermen have been active users of our Rutgers Sea Surface Temperature datasets for almost two decades now. They really appreciate the real-time access of easy to use imagery, especially higher resolution maps of local areas (i.e. fishing grounds). While temperature (and to a lesser extent chlorophyll) maps are their go-to images, what they really want to see are maps of convergence and divergence. Today, they infer areas of high and low divergence by looking for “fronts” in the data. Dedicated convergence maps (based on temp, chl or even current datasets), would point them more clearly to the areas they’re interested in. To do all of this, two key variables play a major role. Wind speed helps them direct boat operations. For example, is it too windy to move boats through narrow channels or to rough for pilots to transfer between vessels? And water level helps them know if they have enough clearance between the vessel’s keel and the channel, or whether they have enough clearance to go under a bridge. It can also let them know if they dock they’re headed to might be under water. (Apparently some in NYC do flood, and it doesn’t make sense to dock if the longshoremen won’t be able to offload the ship.) Having these data with an 8-12 hour forecast is ideal to plan upcoming operations like ship transfers. The Coast Guard is chiefly interested in short term forecasts to warn pilots of upcoming conditions. Projections out to 96 hours would help them manage their assets. They are really interested in knowing more about the currents in the river. Commercial Fishermen have needs very similar to recreational fishermen, although I gather they have a greater interest in longer-term forecasts to plan operations. Fisheries Managers are more interested in historical datasets, in particular those data products that provide climatologies and statistical models of the distribution of physical an chemical variables and fish stocks. And what are Educators looking for? To my mind, they are happy use any dataset or visualization that is easy to understand, and more importantly, one that makes a strong connection to a answering a cool science question. Of the lot, the last one might be the tallest order. Real-time data use in classrooms and other educational settings has gained a lot of attention in recent years. But the challenges to using and incorporating data effectively are still immense. Most of us are still in the prototype phase, trying to build new interfaces and curricula to find out what works. As a result, we spend a lot of time conducting needs assessments on what we know, what’s already out there and what we need to fulfill our goals and the needs of our audience. 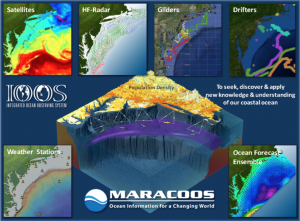 A fellow observatory educator recently asked me what studies on using real-time data in ocean education I was aware of. So here’s a place to start. 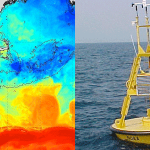 A few years ago we (Rutgers University) conducted a needs assessment for NOAA’s NERRS on Using Ocean Observing Systems in K-12 Education. While a bit dated, this is still one of the most comprehensive reports that I’m aware of, at least in this specific area. A lot of it’s recommendations are still quite valid, in particular the guidance on what datasets to start with, the need to keep interfaces easy to use, and the necessary supports for teachers. Danny Edelson, currently at National Geographic, has a number of good papers on how to incorporate the usage of real data in the classroom, particularly GIS-based data. Good starters are Learning for Use: A framework for the design of technology-supported inquiry activities and Visualization for learners: A framework for adapting scientists’ tools. Shawn Rowe, at Oregon State, is actively researching how to make more effective visualizations. His team recently conducted a number of user studies on color scales and graph annotations which you can find in Seeing satellite data. 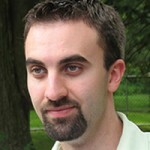 Shawn also presented his insights in several COSEE NOW webinars that you can watch online. Along the same lines, a few years ago the COSEE NOW team conducted a usability test with a half-dozen fishermen in which we showed them various web sites and data visualizations to gauge how easy they were able to find their way around the web interfaces and understand the imagery. Finally, Carlton College has a collection of resources on Using Data in the Classroom and Teaching with Data, Simulations and Models, though much of it is geared towards undergraduate educators. This isn’t a long list and I’m sure there are more studies or needs assessment reports out there. Please comment below if you know of any. But I think it’s clear that we all still have a lot more to learn. In the first of several series I hope to start on this blog, let start off with our first installment of Better Know a Dataset. Given that New Jersey is currently in the midst of a sweltering heat wave (record highs around 103 °F were set it many places today), it seems only appropriate that we should start with temperature. 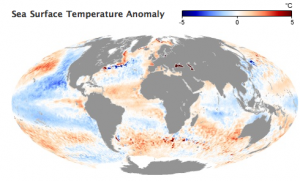 Sea Surface Temperature, or SST for short, is the most common ocean data measurement you will run across. 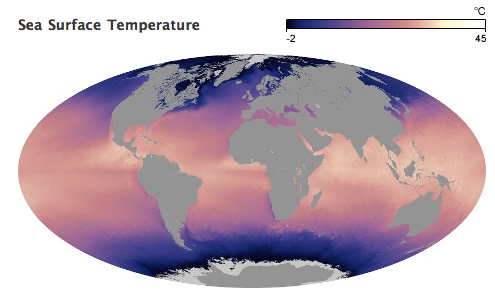 Temperature is the easiest variable to measure in the ocean (and anywhere else for that matter), and as a result you can easily find oodles of temperature data online, often spanning back several decades. 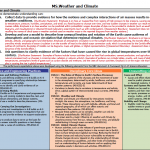 Surface actually is a relative term, as it depends on how the temperature is measured. Surface buoys typically include a temperature probe underneath the surface, about 3 feet down. This insures the temperature measurement reflects the water temperature only, and does not bob in and out of the water. But perhaps the most popular SST datasets are those measured from satellites, like the AVHRR sensors on NOAA’s POES satellites. The advantage of satellite SST data is that it can map out entire regions of the ocean’s surface, rather than just one point. The disadvantages are that satellites may not pass over a region every day, they have a lower spatial resolution (typically 1km^2) whereas a buoy can measures small scale changes in temperature, and if clouds are present most satellite sensors can not see through them. 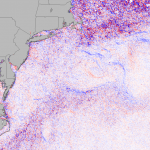 Satellites are able to record the temperature of the ocean’s surface by measuring the emitted infrared radiation from the ocean. In theory, this measurement is from the top few micrometers of the surface. In actual practice, given that the ocean is a very dynamic place with a lot of wind, waves and mixing, the top few micrometers are often essentially the same as the top few feet or more. However, on a calm sunny day the skin temperature may be several degrees higher than the true surface layer. In oceanography, nothing is ever easy. 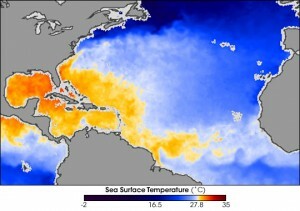 The image above, from the Rutgers Coastal Ocean Observation Lab, is a quintessential example of a SST image. It shows snapshot of sea surface temperature that was recorded by the satellite NOAA-15 as it flew over the Mid Atlantic earlier today. The white area on the left is the East Coast of the United States. You can see Cape Cod near the top right and Cape Hatteras in the bottom left. 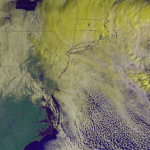 The recognizable coastlines of New Jersey, Long Island and the Chesapeake Bay are also clearly visible. 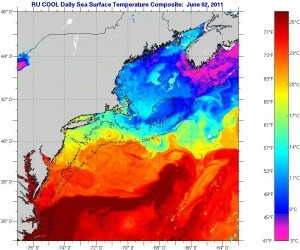 The temperature data in this image is colored using the typical scientist’s palette, that is, the color scaling uses the full rainbow of colors to show a full range in temperatures. While this is not a very intuitive color scale (a topic we’ll delve into in future posts), it is one that is commonly used by scientists to extract as much detail from the data as possible. 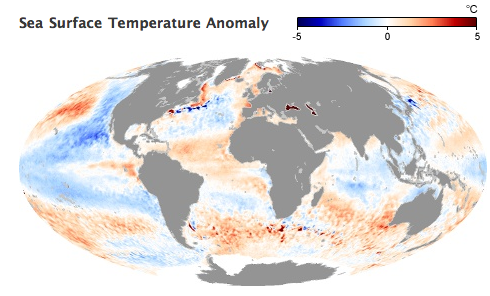 Red and orange areas depict the warmest areas while blue and purple areas are the coolest. 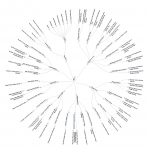 Many web sites use a static color map throughout the year. 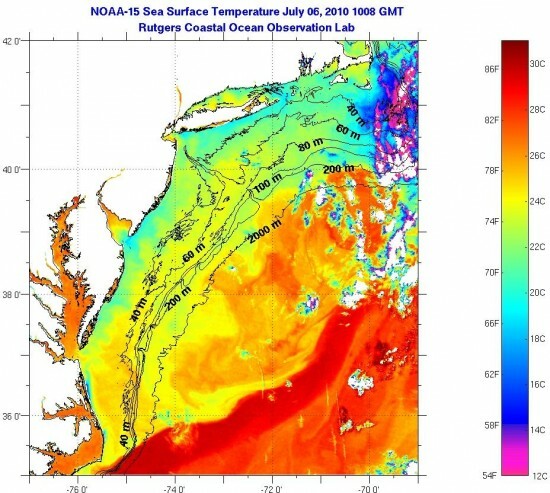 However, due to the extreme range in ocean temperatures over the course of a year in the Mid-Atlantic and the desire of scientists, fisherman and others, to be able to extract all the features possible out of these images, Rutgers constantly changes the scales on their color map to keep up with the changing temperatures. This means you need to constantly check the color scale, as red areas on one image may not be the same temperature as red areas on another image. There are several notable features in this image. 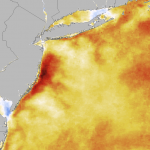 The red ribbon of warm water toward the bottom of the image is the Gulf Stream. 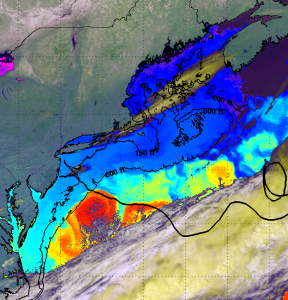 Above the Gulf Stream and in the midst of the clouds, you can see a warm core eddy, that shows up as a red circle. This eddy was originally part of the Gulf Stream before it split off and started heading back towards the coast. The eddy itself rotates in a clockwise direction. Off the coasts of Delaware, New Jersey and Long Island the temperatures are somewhat cooler than further offshore. 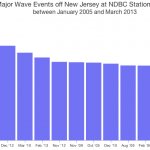 This is due to coastal upwelling. Over the past week, winds in the area have been from the Southwest, which when combined with the forcing from the Earth’s rotation, drives surface waters offshore and allows cooler waters to come to the surface. 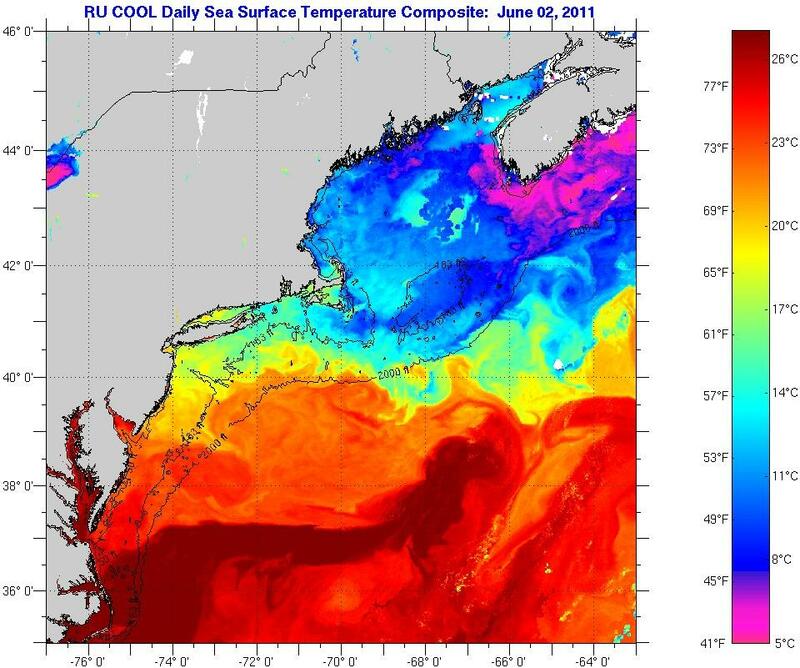 Upwelling also brings nutrient-laden bottom waters to the sunny surface where phytoplankton can have a feeding frenzy. As you can see, sea surface temperature maps provide a rich dataset to analyze ocean currents and features that impact the biology and chemistry in the ocean. Of course, they can also help you find a cool beach on a hot day.